Magical moulding fun with the amazingly light dough that never dries out! Create your own farm. 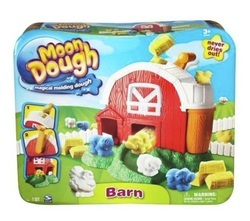 Simply place the Moon Dough in the top of the big barn, turn the handle and see the farm animals magically pop out! It could be a horse, a chicken or maybe a cow or a sheep! Mould some hay to feed your animals, then mould a fence to keep them in. If your horse gets tired pop him in the stable with the swing door for a rest. Includes barn, fence and hay moulds, themed play mat and 3 colours of Moon Dough. Contents vary. Love this and want another present for active little hands? Look at the fabulous Pumpaloons game!